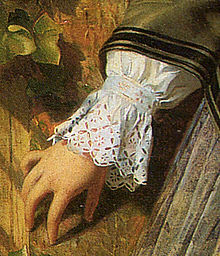 Broderie anglaise (French, "English embroidery") is a whitework needlework technique incorporating features of embroidery, cutwork and needle lace that became associated with England, due to its popularity there in the 19th century. Broderie anglaise is characterized by patterns composed of round or oval holes which are cut out of the fabric, called eyelets, which are bound with overcast or buttonhole stitches. The patterns, often depicting flowers, leaves, vines, or stems, are further delineated by simple embroidery stitches made on the surrounding material. Later broderie anglaise also featured small patterns worked in satin stitch. The technique originated in 16th century eastern Europe—probably in what is now the Czech Republic—but remains associated with England because of its popularity there during the 19th century. In the Victorian era, broderie anglaise typically had open areas in many sizes. Transfers were used first to lay out the design on the material. In some cases, the holes were punched out with an embroidery stiletto before finishing the edge; in other cases, the fabric was embroidered first, and the hole was cut afterwards, with scissors. Beginning in the 1870s, the designs and techniques of broderie anglaise could be copied by the Swiss hand-embroidery machine. Today, most broderie anglaise is created by machine. Broderie anglaise was extremely popular in England between 1840-1880 for women's underclothing and children's wear. The 1950s saw a resurgence in popularity, when it was frequently used to trim dresses and underwear. In 1959, Brigitte Bardot wore a dress of gingham and broderie anglaise for her wedding to Jacques Charrier. In contemporary western fashion, it has been featured on a wide variety of modern garments such as shorts and even t-shirts. It has been characterized as "lace, but scaled-up" making it more robust and suited to daytime wear, and less associated with the fine, lacy look of lingerie. S.F.A. Caulfield and B.C. Saward, The Dictionary of Needlework, 1885. ^ "broderie anglaise". Encyclopædia Britannica Online. Encyclopædia Britannica Inc. Retrieved 13 September 2013. ^ a b c Catherine Amoroso Leslie (1 January 2007). Needlework Through History: An Encyclopedia. Greenwood Publishing Group. pp. 34, 226, 58. ISBN 978-0-313-33548-8. Retrieved 13 September 2013. ^ "Broderie Anglaise". Embroidery Types. The Embroiderers' Guild of Western Australia. Retrieved 13 September 2013. ^ Cartner-Morley, Jess (March 30, 2012). "How to dress: broderie anglaise". The Guardian. Retrieved 13 September 2013. 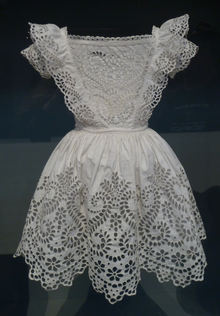 Wikimedia Commons has media related to Broderie Anglaise. This page was last modified on 10 February 2014 at 21:02.